So it’s been a couple of weeks since Google+ launched and I’ll be honest, I’m really struggling with the service. I wanted to give it a few weeks before writing anything, which has been helpful in letting my thinking mature. First, before my Google friends get upset, I want to acknowledge the reason I’m struggling has more to do with me than with Google+. My sense is that Google+ is designed to manage personal networks. In terms of social networking, the priority, like at Facebook, is on a soft version of the word “social” eg. making making the experience friendly and social, not necessarily efficient. And I’m less interested in the personal experience than in the learning/professional/exchanging experience. Mark Jones, the global communities editor for Reuters, completely nailed what drives my social networking experience in a recent Economist special on the News Industry: “The audience isn’t on Twitter, but the news is on Twitter.” Exactly! That’s why I’m on Twitter. Cause that’s where the news is. It is where the thought leaders are interacting and engaging one another. Which is very different activity than socializing. And I want to be part of all that. Getting intellectually stimulated and engaged – and maybe even, occasionally, shaping ideas. And that’s what threw me initially about Google+. Because of where I’m coming from, I (like many people) initially focused on sharing updates which begged comparing Google+ to Twitter, not Facebook. That was a mistake. 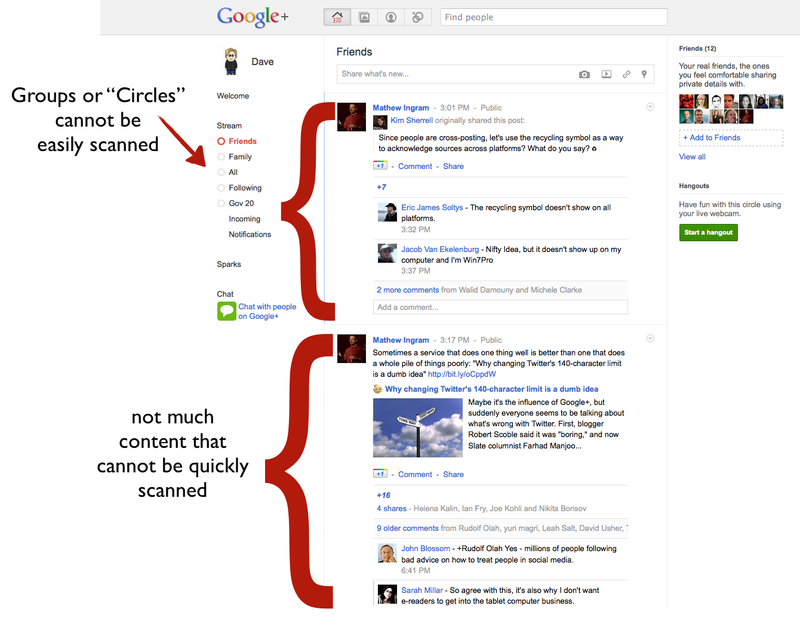 But if Google+ is about about being social above all else, it is going to be more like Facebook than Twitter. And therein lies the problem. As a directory, I love Facebook. It is great for finding people, checking up on their profile and seeing what they are up to. For some people it is good for socializing. But as a medium for sharing information… I hate Facebook. I so rarely use it, it’s hard to remember the last time I checked my stream intentionally. So I’m willing to accept that part of the problem is me. But I’m sure I’m not alone so if you are like me, let me try to further breakdown why I (and maybe you too) are struggling. Too much of the wrong information, too little of the right information. The first problem with Google+ and Facebook is that they have both too much of the wrong information, and too little of the right information. What I love about Twitter is that it forces writers to be concise. Really concise. This in turn maximizes efficiency for readers. What is it Mark Twain said? “I didn’t have time to write a short letter, so I wrote a long one instead.” Rather than having one, or even thousands or readers read something that is excessively long, the lone drafter must take the time and energy to make it short. This saves lots of people time and energy. By saying what you’ve got to say in 140 characters, you may work more, but everybody saves. On the other hand, while I want a constraint over how much information each person can transmit, I want to be able to view my groups (or circles) of people as I please. 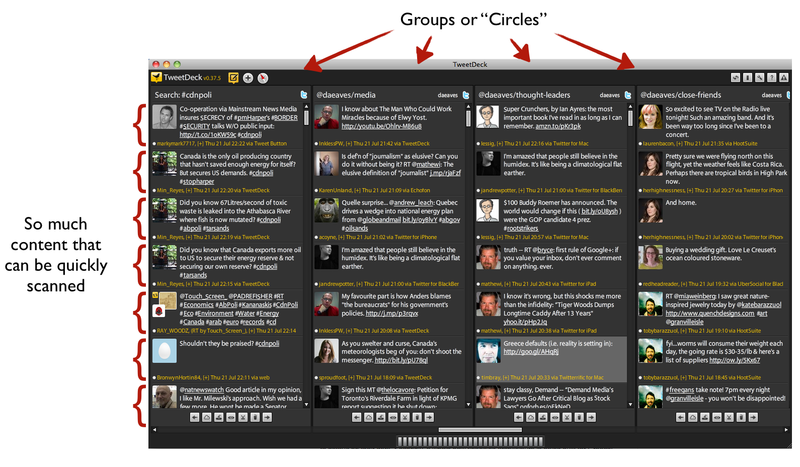 Consider the screen shot of TweetDeck below. Look how much information is being displayed in a coherent manner (of my choosing). It takes me maybe, maybe 30-60 seconds to scan all this. In one swoop I see what friends are up to, some of my favourite thought leaders, some columnists I respect… it is super fast and efficient. Even on my phone, switching between these columns is a breeze. But now look at Google+. There are comments under each item…but I’m not sure I really care to see. Rather then the efficient stream of content I want, I essentially have a stream of content I didn’t ask for. Worse, I can see, what, maybe 2-5 items per screen, and of course I see multiple circles on a single screen. Obviously, some of this is because Google+ doesn’t have any applications to display it in alternative forms. I find the Twitter homepage equally hard to use. So some of this could be fixed if (and hopefully when) Google makes public their Google+ API. But it can’t solve some underlying problems. Because an item can be almost as long as the author wants, and there can be comments, Google+ doesn’t benefit from Twitter’s 140 character limit. As one friend put it, rather than looking at a stream of content, I’m looking at a blog in which everybody I know is a writer submitting content and in which an indefinite number of comments may appear. I’ll be honest: that’s not really a blog I’m interested in reading. Not because I don’t like the individual authors, but because it’s simply too much information, shared inefficiently. And herein lies the second problem. The management costs of Google+ are too high. I get why “circles” can help solve some of the problems outlined above. But, as others have written, it creates a set of management costs that I really can’t be bothered with. Indeed this is the same reason Facebook is essentially broken for me. Using circles to manage for professional reasons makes way more sense. That is essentially what I’ve got with Twitter lists. The downside here is that re-creating these lists is a huge pain. Okay, so going to the Google+ website is a pain, and I’m sure it will be fixed. But presently my main Google account is centered around my eaves.ca address and Google+ won’t work with Google Apps accounts so I have to keep flipping to a gmail account I loathe using. That’s annoying but not a deal breaker. The bigger problem is my Google+ social network is now attached to an email account I don’t use. Worse, it isn’t clear I’ll ever be able to migrate it over. My Google experience is Balkanizing and it doesn’t feel good. Indeed, this hits on a larger theme: Early on, I often felt that one of the promises of Google was that it was going to give me more opportunities to tinker (like what Microsoft often offers in its products), but at the same time offer a seamless integrated operating environment (like what Apple, despite or because of their control freak evilness, does so well). But increasingly, I feel the things I use in Google are fractured and disconnected. It’s not the end of the world, but it feels less than what I was hoping for, or what the Google brand promise suggested. But then, this is what everybody says Larry Page is trying to fix. Now I also have a reason for actively disliking Google+. After scanning my address book and social network, it asked me if I wanted to add Tim O’Reilly to a circle. I follow Tim as a thought leader on Twitter so naturally I thought – let’s get his thoughts via Google+ as well. It turns out however, that Tim does not have a Google+ account. Later when I decided to post something a default settings I failed to notice sent emails to everyone in my circles without a Google+ account. So now I’m inadvertently spamming Tim O’Reilly who frankly, doesn’t need to get crap spam emails from me or anyone. I’m feeling bad for him cause I suspect, I’m not the only one doing it. He’s got 1.5 million followers on Twitter. That could be a lot of spam. My fault? Definitely in part. But I think there’s a chunk of blame that can be heaped on to a crappy UI that wanted that outcome. In short: Uncool, and not really aligned with the Google brand promise. I remember initially, I didn’t get Twitter; after first trying it briefly I gave up for a few months. It was only after the second round that it grabbed me and I found the value. Today I’m struggling with Google+, but maybe in a few months, it will all crystallize for me. Ultimately, if everybody moves, I’ll adapt, but I way prefer the simplicity of Twitter. If I had my druthers, I’d just post everything to Twitter and have it auto-post over to Google+ and/or Facebook as well. But I don’t think that will happen. My guess is that for socially driven users (e.g. the majority of people) the network effects probably keep them at Facebook. And does Google+ have enough features to pull the more alpha type user away? I’m not sure. I’m not seeing it yet. But I hope they try, as a little more competition in the social networking space might be good for everyone, especially when it comes to privacy and crazy end-user agreements. This entry was posted in commentary, reviews, technology and tagged facebook, google, mozilla, social media, social networks on July 22, 2011 by David Eaves. Google+ is not a social network. I think this is what you’re not getting. It’s a dashboard to the internet. Once it’s opened up and allows developers in, I suspect it will become a more friendly space where you can use the apps you want (ie Twitter/Tweetdeck), and connect with the people you want in a more cohesive manner. One other important difference between Google+ and FB, and Twitter, boils down to the friending asymmetry — you choose who you want to follow in Twitter and can even use the filters to limit your view to what you like about them (if they are proactive about hashtags and keywords and so forth) – you control what you see. FB and Google+ puts the power back in the hands of the originator through their decision to post this or that to their circles. As a tool for learning, as you highlight, this takes away the self-direction and fine-grained tailoring that makes Twitter comparably enjoyable. But as a tool for “performing” social, that control over what is being shared to whoever, for the individual, is important. I’m confident that the entry of Google+ will nuance the distinction between these two use cases. I’m pretty much holding out for Google Reader integration before I make up my mind — since I live a large chunk of my life in there — and letting my use be completely minimal until that point. The lack of Google Apps support is a problem for me too – since I’m the only person on my PC, I leave my browser logged into my account – so to use G+, I need to log out and log in to an email address I never use (on the plus side, it means all the notification emails are going to an email address I never use). The “wall” is also confusing, because “following” seems to for Twitter like activity (e.g. follow people you don’t actually know), but in that case, I would want following to not appear in my main wall, and only when I go to it. My other issue is that the early adopters seem to be mostly technoheads and so my wall activity is all sharing links or commenting on G+ – there isn’t much social stuff going on there yet. One issue I see with your argument is that you’re treating Circles like Twitter lists. Circles are much more than just your incoming messages, they’re used to manage who can see what posts. I’ve been using Google+ for over three weeks now and I have to say I’m finding it much more easy to manage the flow of information there than on Twitter and Facebook. If nothing else, the community on G+ participates much more in conversation than on other networks. Try looking at Google+ from angles other than what you’re used to on Twitter and FB and hopefully it will start to make more sense. Hi dmonzel – Good thoughts! Thank you for posting them here. I understand that twitter lists and google circles are different and allow for more nuanced sharing, the problem is that personally, I find it hard to imagine managing those circles – moving people in and out of them as my life evolves. I don’t do it on facebook because it is too much of a drag. I see that it is simpler to do with Google+ but, for me, still not worth the investment and upkeep. Maybe that will change. I can see the Google+ could operate more as conversations… but I’m not really sure that’s what I want. It adds that functionality at the expense of information density, which presently, is much more important to me. Great post David. I agree completely. While I have accounts on Facebook and Google+ I always go to Twitter and then link my posts through the other two. I do not have hours a day to surf social sites and glean info. Twitter is much more like an RSS reader, concise, clean and efficient. Wow! I feel the same way…..I bailed on facebook, wanted it only for business and couldn’t get my personal page deleted to just maintain my business page so I had to delete both accounts and start all over again with a different email to set up just a business page on facebook. Starting from 0 “like”s, I lost all those original followers…I’m trying to figure this g+ thing out now and right now, I’m shut out. I think I signed up, but it won’t let me do anything because it’s working out the kinks and to stay tuned. I don’t want a social “friends” network, I want it for business and being in touch with people in jewelry assembly outsource and jewelry design fields. Thank goodness for twitter! So easy…. Gmail supports multiple account logins. I have been logged into G+ tied to the non-App email as well as two App email accounts. No need to logout, just change browser tabs. Hi _witt, thank you for the comment. I’m aware Gmail supports multiple accounts and that you can flip between accounts – that’s how I’m able to use Google+. This however, does not address the balkanization problem I raise in the post.